Your favourite vegetables are wrapped in a silky smooth cheese sauce and topped with buttery puff pastry in this Cheesey Vegetable Pie. Get the recipe below. A couple of weeks ago I asked you in an Instagram story whether or not you wanted me to make a cake or a pie for the blog. I’d intended to bake a sweet pie, maybe cherry, rhubarb or a classic apple pie but the fruit in the store looked a little lack lustre and our kitchen garden is almost bare now. If I wasn’t going to make pie for pudding then it had to be the main event. I raided my fridge (and freezer) for leeks, carrots, mushrooms and peas then turned them into a rich and creamy Cheesey Vegetable Pie. To make the pie I started off by thinly slicing the leeks, dicing the carrots and sauteing them in a little butter and oil. Once they’d begun to soften I added the mushrooms and some garlic. I let this all cook down for a good 5 to 10 minutes before adding in a couple of spoon fulls of flour. Once the flour had soaked up all of the butter and the juices from the vegetables I added in the milk and cheese, then cooked it on a low heat until a thick sauce began to form around the vegetables. Some wholegrain mustard, salt, pepper and a handful or two of frozen peas finished it off. I spooned the cheesey vegetable mixture into my oven dish and then topped with a puff pastry lid. Quick confession – I didn’t make the puff pastry! Life is just way too short to both making your own puff pastry. Just roll it out, cut it to the right size so it covers your oven dish and then cut out “say cheese” from the trimmings. I even cut out a few steam holes so that it looked like Emmental! In a sauce plan, melt the butter in the olive oil on a low heat before adding the sliced leek and the salt then cook for 2-3 minutes. Add the diced carrot and cook for another 5-8 minutes until the carrots and leeks have started to soften. Add the mushrooms and crushed garlic to the pan and cook for another 5 minutes. Next, add the plain flour to the ban and stir until the butter and juices from the vegetables have created a paste with the flour. Pour in the milk and mix well so that the flour dissolves in the milk creating a thick sauce. Let the sauce simmer gently before adding the cheese, mustard and black pepper. Once the cheese has melted add in the frozen peas. Cook until the peas have thawed and the cheese sauce has thickened. While the cheesey vegetables are cooking, roll out your pastry and cut out a lid, exactly the same size as the top of your oven dish. 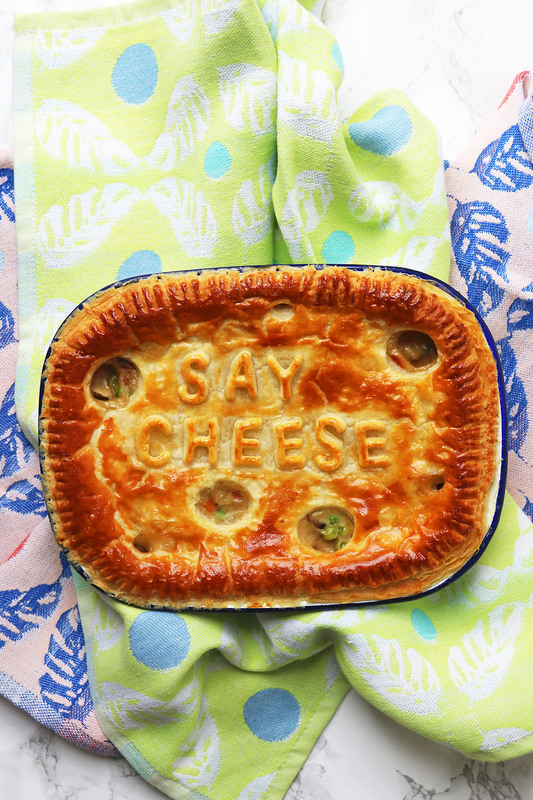 Cut out "say cheese" using alphabet cutters from the leftover puff pastry. Spoon the cheesey vegetable mix into your oven dish. Place the pastry lid on top of the vegetables and press the edges down using a fork. 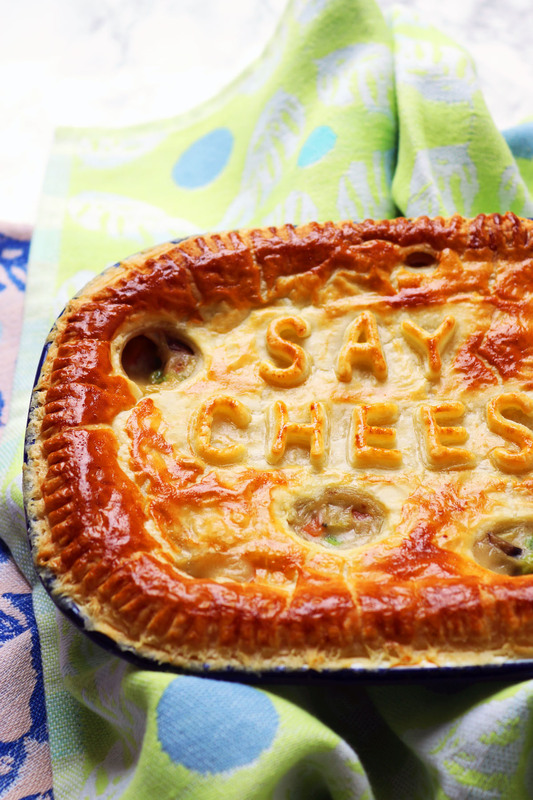 Brush the pastry with the beaten egg and stick the "say cheese" letters on top. Place into the centre of your oven and cook for 45 minutes or until the pastry is crisp and golden brown. Serve immediately with some steamed green veggies. This a great comfort food dish that can be knocked up so easily from standard ingredients and it is sure to please the whole family. I do like your fun styling of this pie. Thanks Lucy 😀 I try to keep things as simple as possible! how creative this is, I would never have the patience to do this fun food art but would love to be eating this right now! Thanks Claudia. It’s really easy if you have some mini letter cutters – I use ones from Wilton! How fun and cute with the lettering. I hear you on not making your own puff pastry! This is so much easier. This is so cute! I love that you put the lettering on the top of the pie. I’ll have to give it a try! Love the idea of this pie. I’m totally addicted to cheese and love to cook with it! Def one to try! Love it and yes agree, life is too short to make puff pastry, I buy a good butter one too! Love the cheesy veg filling, looks great. I love this! Such a fun way to decorate the pie! My Mum used to make something similar but with mashed potato on top. I love your puff pastry version though. Fab. This pie makes me so happy! It’s such a cute and lovely bake and definitely one to try for the weekend!